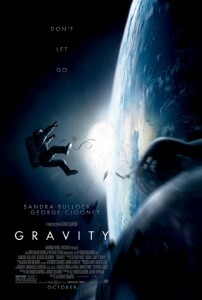 Gravity is a drama starring Sandra Bullock and George Clooney. When disaster strikes during a routine satellite repair, medical engineer Dr. Ryan Stone and veteran astronaut Matt Kowalsky are left completely alone. They have lost all connection to Earth nullifying any chance of rescue. With every panic-laced breath consuming oxygen, they soon discover the only way home might be further into space. Before I write this review, I need to confess something. I have an irrational fear of space. At least, I have a fear of being lost in space. Granted, I don’t know too much about physics in space, but after watching the film, my curiosity drove me to read numerous reviews with various opinions on the accuracies or inaccuracies of Gravity. One of these reviews was written by a retired astronaut which you can find by venturing here. In summary, Gravity got more right than it got wrong, but what it got wrong was completely wrong. Many inaccuracies in the film were used to build intrigue and drive the plot along which makes sense. Honestly, I’m only bothered by one inaccuracy. [Spoiler] Clooney’s self-sacrifice was pointless. When Sandra catches hold of him, he would simply float there and a small tug would bring him back to the station. He didn’t need to die. Then again, if Clooney had survived, some of the urgency of the film would disappear. [/Spoiler]. Remember, Gravity is a science fiction movie. The movie is not based on actual events and should not be judged with the scrutiny one would judge a space documentary based on an actual disaster, such as Apollo 13. At the end of the day, Gravity is a science fiction movie. That’s all. Just a movie. So, let’s talk movie quality. Sandra Bullock is amazing. Bullock is not actually in space during this movie. She is acting in front of a green screen. Her imagination and commitment to the role is breath-taking. Bullock’s performance enables the audience to feel the anxiety of Dr. Stone’s situation—lost in space with no way home. I found my heart racing and my breaths growing shallow throughout the film. Bullock’s Oscar nomination for best actress is well deserved; however, I do not think Gravity should win Best Film. I know, I know. Please don’t kill me. Yes, the cinematography was gorgeous (especially in 3D), and Alfonso Cuarón definitely deserves a nod for his directing, but the story itself felt choppy and scattered. In many ways, movie felt like a roller coaster with plenty of ups and downs but without any real sense of purpose. Overall, I give the film 8.5/10 stars. An exciting journey to watch unfold with a brilliant performance from Sandra Bullock but an overall forgettable storyline. This movie was great, but I definitely agree with the Gif at the end of this review! It is super movie and I love it.